Intended use: Running - stability. 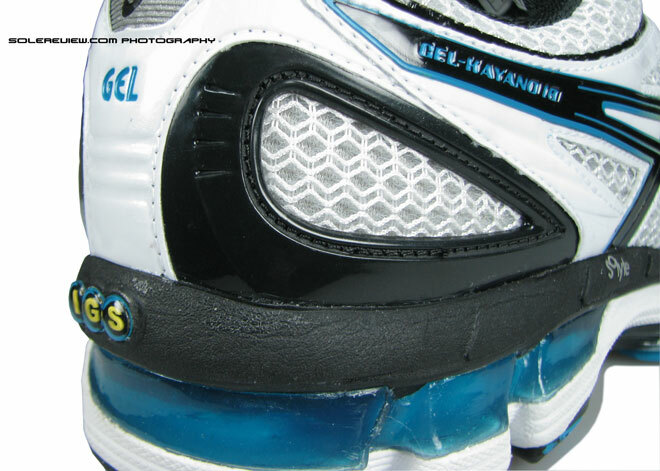 Midsole: Compression molded EVA, hard foam insert on the arch side, Gel cushioning units, thermoplastic (TPU) shank. 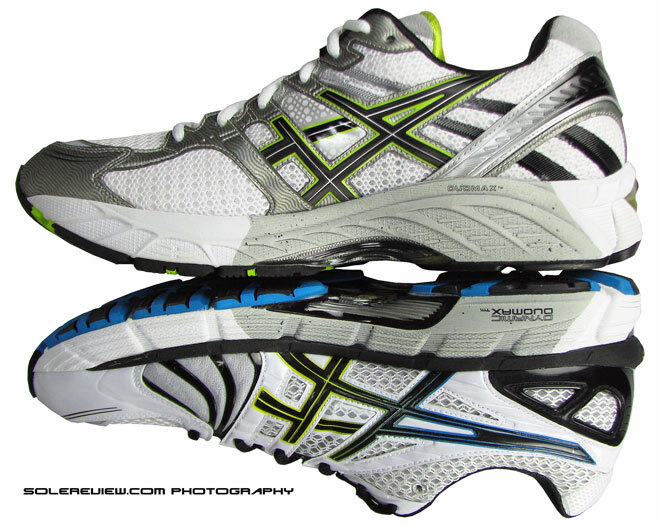 A completely reworked Kayano for 2012 which also appeals to neutral runners. There are very high expectations of a franchise shoe model which has been around for two decades. Year after year, athletic footwear manufacturers work hard to build in new features, make the shoe lighter or better fitting, and so on. In most cases, the tweaks are small, and the shoe retains the original attributes which made it popular in the first place. In exceptional cases, the shoe changes so much that the only thing it shares in common with the previous model is the name. Luckily, in Asics Kayano 18’s case, the updates are progressively incremental and it brings to the table the all familiar fit and feel of the Kayanos gone by. This middle path is a place where we’re all comfortable in; after all, why fix a thing which isn’t broken? 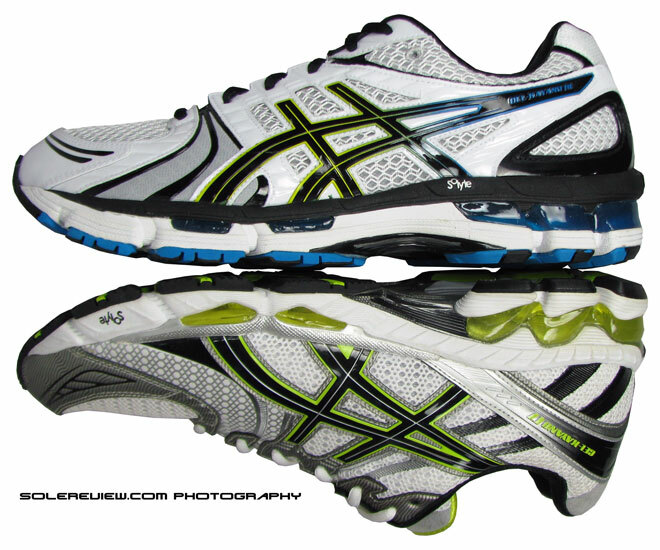 The Asics Kayano has always been the go-to shoe when it came to finding a footwear solution for pronators. 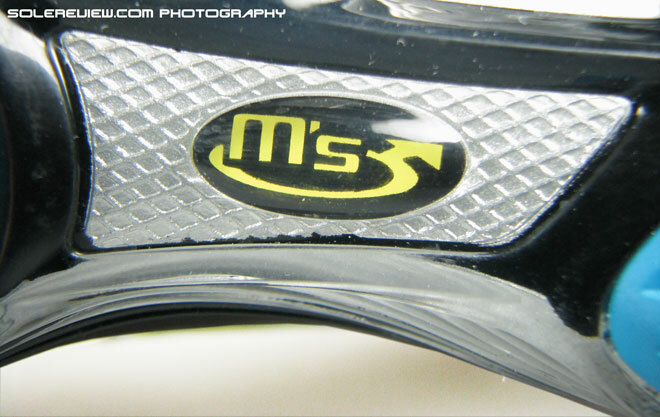 The firm, reassuring ride with a dual density midsole and a high spec’ed upper translated into 19 years of success and a place in the Asics hall of fame. The core fundamentals behind the shoe hasn’t changed much over the last many years; and like most athletic footwear, it has incorporated benefits from evolutionary advances in footwear manufacturing technologies. Things like, no-sew uppers, high frequency welding, better foams, the list goes on. Asics has built in a few changes in the Kayano 18, and while e-commerce websites are using words like “revolutionary”, “significantly lightweight”, in comparison to last year’s Kayano 17, we can assure you it’s nothing like that. The bottomline is that the Kayano 17 was a great shoe, and the Kayano 18 carries on the legacy silently with some design updates. Minus the fuss and drama. This year’s Kayano 18 brings in a few new features which can be definitely classified as incremental improvements over version 17. We’ll quickly sum up the updates in the order of the images you see above. The Kayano 18 has a redesigned ‘Solyte’ midsole foam component, seen here in this colorway as a layer of black foam sitting over the lower half of the white midsole and Gel cushioning units. 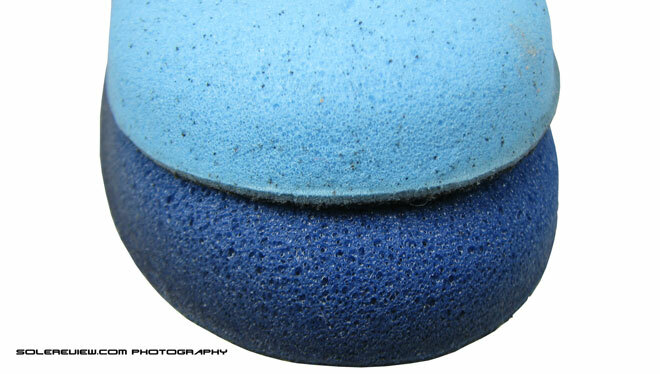 This strip of foam goes 360° around the heel and extends right to the front, resting just below the toe area. And as you can see the pictures below, the Kayano 17’s midsole foam was single compound for the most part, save the dual density foam on the arch side. 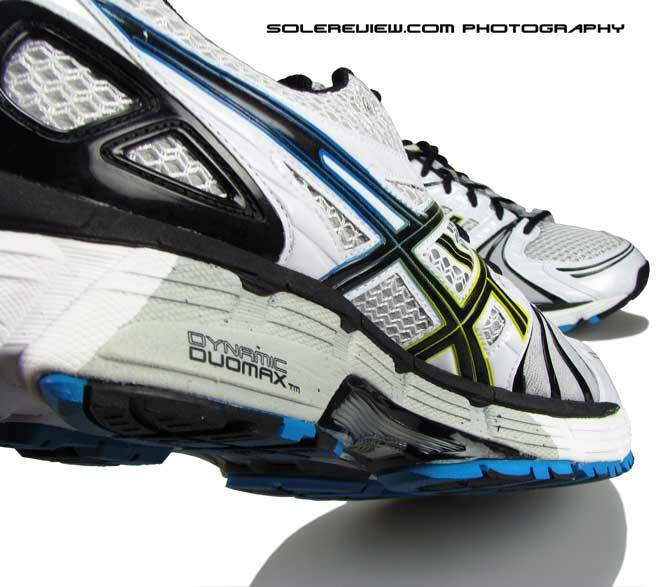 The images that follow next walk you through the re-profiling of the Asics Gel cushioning units. 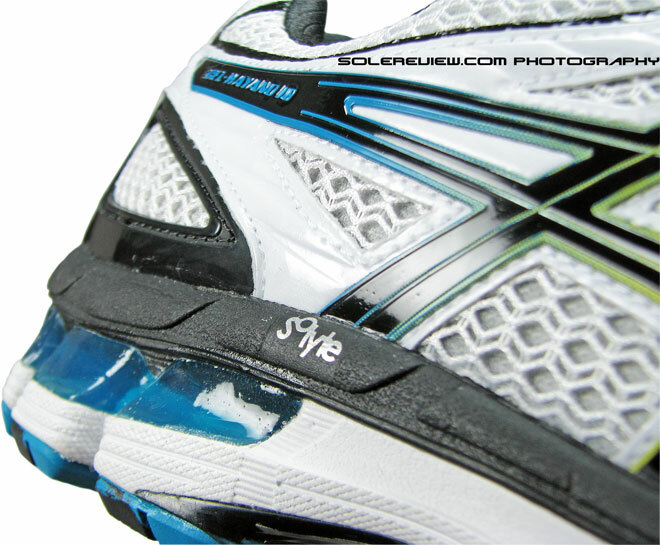 The visible area of the Asics Gel unit has reduced relative to Kayano 17, one reason being the introduction of the new Solyte midsole top layer. It did affect the way the shoe handled, and we’ll come down to that in a moment. 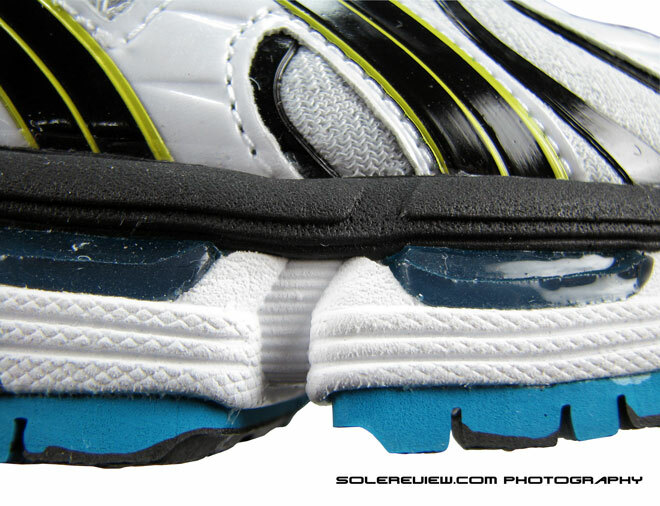 The image just above this paragraph shows the inclusion of a brand new external heel counter, a semi-flexible plastic component which goes around the heel area. Whenever we review the ‘before and after’ versions of any shoe (which in this case being the Kayano 17 and 18), the first impression test includes first running in last year’s version, and then complete a long run in the current version and then back in the previous version. All immediately back to back, spread over a few days. This allows us to fine tune our assessment of what’s newer and better (or otherwise). Running back to back (and again) in these shoes also highlights minute differences in ride, features and fit which can otherwise get missed. More so, when the current version strives to carry over the fit and feel without upsetting familiarity. 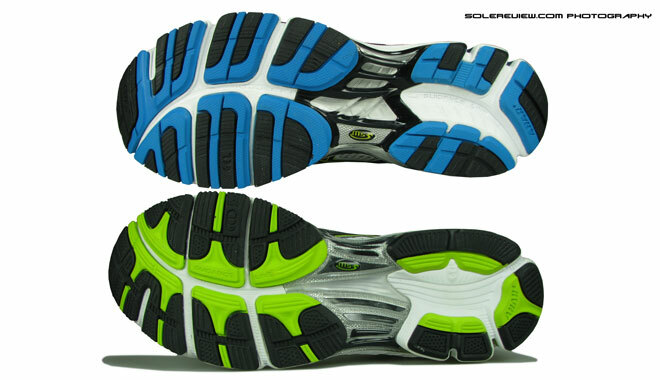 When we ran this test on the Kayano 18, we observed two things which were different than the 17. First being the overall ride and the heel roll. During the gait cycle, the Kayano 18 rolled less outwards as compared to the 17. 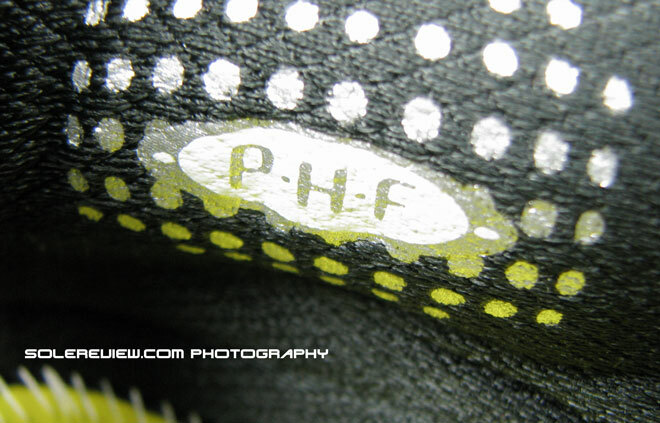 The science behind this is the change in the midsole contruction. The picture above shows the arch side of the Kayano 17 (top) and Kayano 18(bottom) and you’ll notice how the hard dual density midsole foam has been set up in both the shoes. In the Kayano 17, the harder density foam goes over the line where the upper and midsole bond together, and absolutely prevents the foot from rolling in. It is a different story in the Kayano 18’s case though. 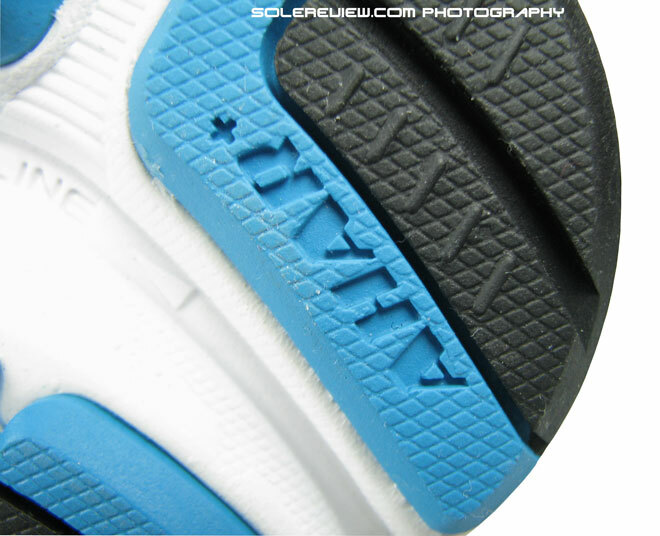 The newly inserted Solyte midsole layer comes between the dual density foam and the upper, so it allows some amount of roll towards the arch side. 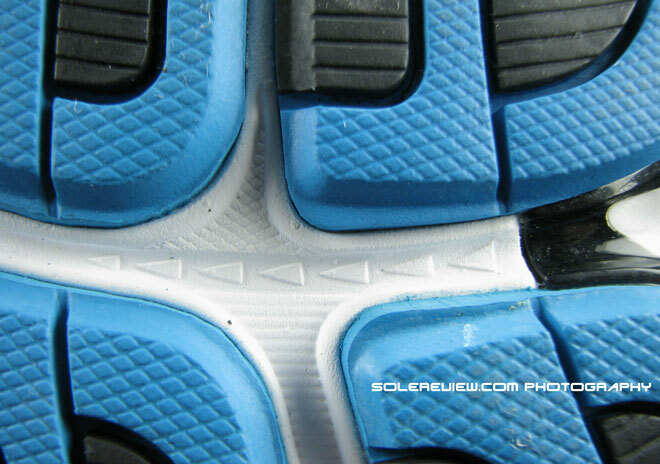 The new Solyte midsole layer also results in a more uniform ride, improving the heel to toe transition. The other reason beind the reduced outer heel roll in the Kayano 18 is the change in the positioning of the Asics Gel units. 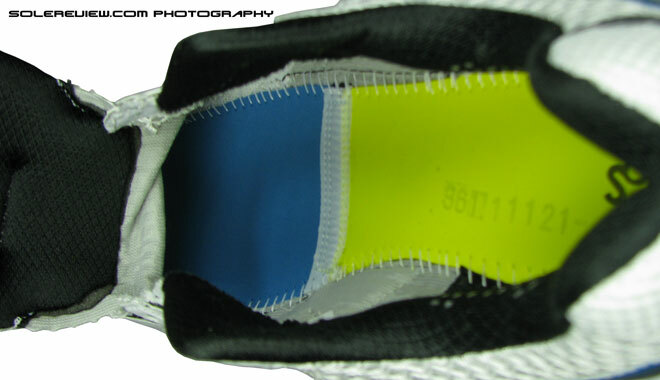 In the Kayano 17, the midsole had larger visible Gel units, which being softer than foam, caused the heel to roll in outwards. 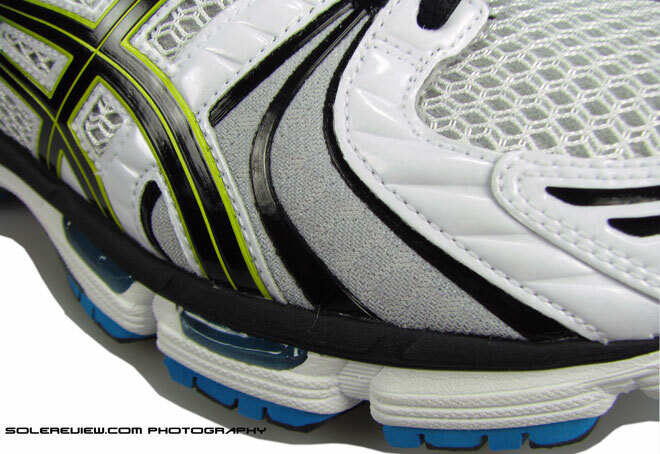 The fact that the Kayano 17 also had a bigger harder density foam on the arch side kept the foot on the outer side, where the Gel pads helped the heel roll outwards. So here’s the lowdown – the Kayano 18 will be comfortable for a lot of neutral runners with a regular arch, while retaining its core functionality – that of a pronation control shoe. The Kayano 18 also runs warmer than the previous version, particularly in the forefoot area. The open mesh space in the Kayano 17 near the fifth metatarsal (small toe) on the arch side is now covered with a component of stretch fabric and plastic high frequency welding which restricts ventilation. The same goes for the outer side, where previously open mesh spaces are now covered either with synthetic leather or the stretch panels which Asics calls ‘Biomorphic fit’. So while this is a bonus for runners in cooler climates, it will be a bit of a bother for countries used to triple digit summer temperatures. The outsole gets a redesign in the Kayano 18 – while it continues to carry forward the configuration of soft blown rubber (forefoot) and durabe carbon rubber (rearfoot/heel), it puts in a few minor updates into the equation. 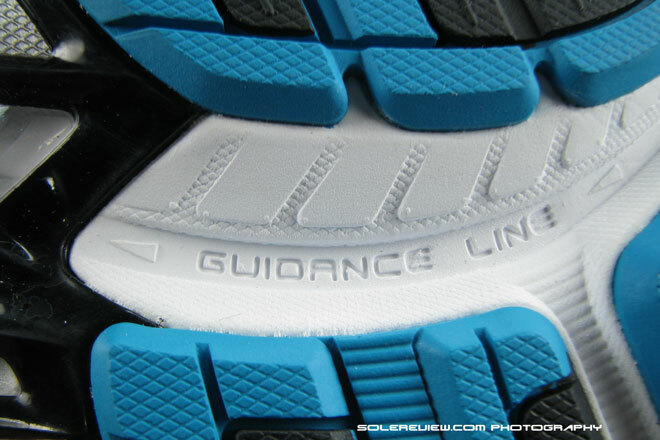 The important one is use of what Asics calls the ‘Guidance line’, a groove which runs along the length of the sole from heel to toe. Asics claims this increases efficiency in gait transition. We’ll be back with a test update on this one. Some good things haven’t changed, like the two piece combination insole, and the comfortable memory foam lining which keeps the heel from slipping. 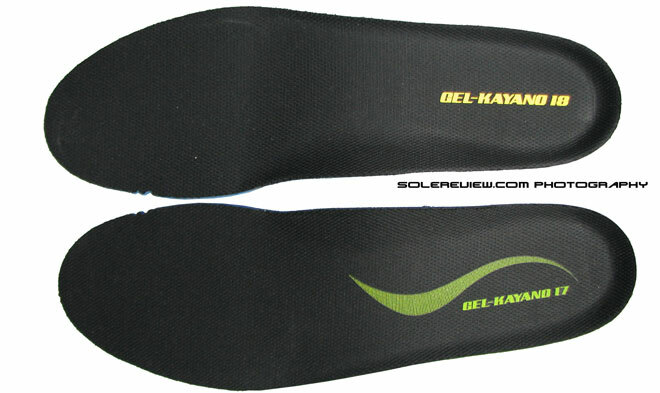 The material of the sockliner in the Kayano 18 seems to have changed though – the open cell structure of sockliner is denser. But that does not affect the ride experience in anyway. The Kayano 18 continues to be a great shoe for runners looking for a pronation control solution. The changes in the newest version of the Kayano are subtle in nature, improving overall ride and increasing affinity with neutral runners. Hasn’t lost much weight though – our US 11 test Kayano 17 weighed in at 370 grams (13 Oz) and so does the Kayano 18 at 368 grams(13 Oz).